Launched at the same time as the Pro Slate 8 tablet, the HP Pro Slate 12 is a business tablet intended for seamless productivity on the go. Contrary to what people might conclude from its appearance, this slate is very light for its size and boasts blazing fast processing speeds. 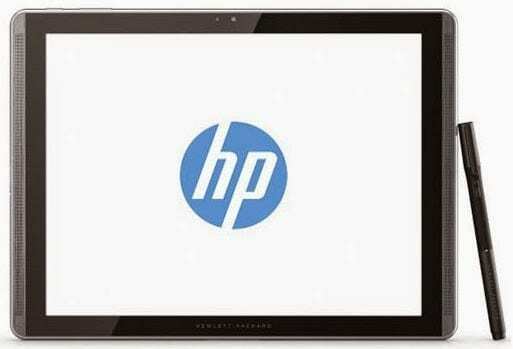 The HP Pro Slate 12 is a stylish tablet, with its attractive silver and black bezel. One would ordinarily expect this beast to weigh a ton, but you will be surprised it weighs just 850 grams. The slate’s portability appeal is improved by its stunningly slim profile at a thickness of less than 8 millimetres. With sight seemingly set on the Samsung Galaxy Note Pro 12.2, the HP Pro Slate 12 packs a massive 12.3-inch screen with a resolution of 1600 x 1200 pixels and protected by tough Corning Gorilla Glass 4. The large display has a 4:3 aspect ratio. Powered by an impressively fast processor, the HP Pro Slate 12 is certainly designed for seamless performance. It carries a quad-core Qualcomm Snapdragon chip running at 2.3GHz and backed by RAM of 2GB. The integrated Qualcomm graphics can play high-definition videos with ease. The slate runs on Android 4.4 KitKat operating system. Just like in the case of the Pro Slate 8, the HP Pro Slate 12 tablet comes with a unique stylus dubbed “Duet Pen.” This unique pen can be used to take notes directly on the slate and on paper, as it possesses swappable digital and ink tips. The notes taken on paper can be easily transformed into digital form through HP’s Paper Folio technology. It is no doubt the Duet Pen will come as a welcome addition to those professional users who hate typing on a tablet all the time. HP Pro Slate 12 comes with onboard storage space of 32GB. It has an 8-megapixel camera on the rear – impressive for a slate – and a 2MP front-facing camera. It has a microUSB 2.0 ports and a microSD slot, while also supporting the latest Wi-Fi 802.11 b/g/n/ac. The slate goes for a price of $529. HP Pro Slate 12 is not yet available in Nigeria. When available, you can buy from reputable online stores in the country. HP Pro Slate 12 Price in Nigeria is expected to range from N100,000 to N140,000, depending on your location in the country.